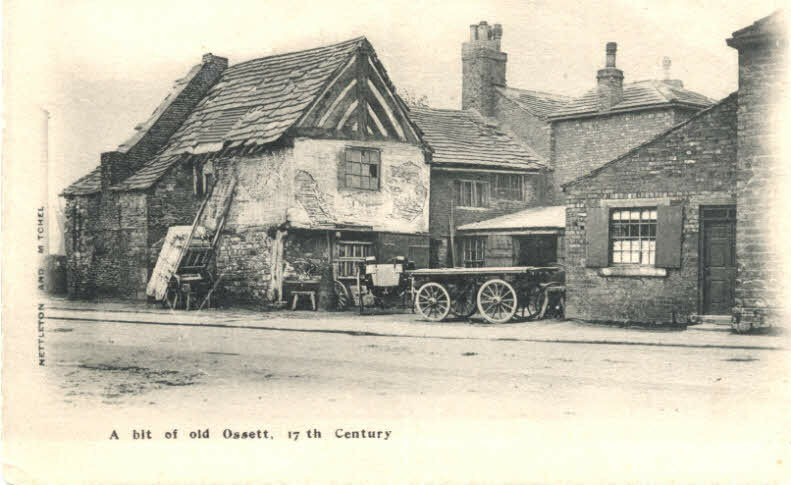 This photograph from about 1900 was on an Ossett postcard and shows buildings dating back to about 1675. It was at first believed that the building was somewhere in the vicinity of Dean's jewellery shop on Bank Street, but in fact the building was located on Illingworth Street, Ossett. "James Wood Forrest was only a boy when he was apprenticed to Mr W.P. Cussins the blacksmith who, at that time, occupied the 17th century gabled building in Illingworth Street. When picture above was taken, in approx 1900, young James was actually in the shop." When this photograph was taken, the original thatched roof had been replaced with stone slates and the chimney had been modified to improve draught flow. The buildings were demolished many years ago, but this is a wonderful reminder how Ossett town centre must have looked in the 17th century.